Tunnel vision is a luxury investors can’t afford. 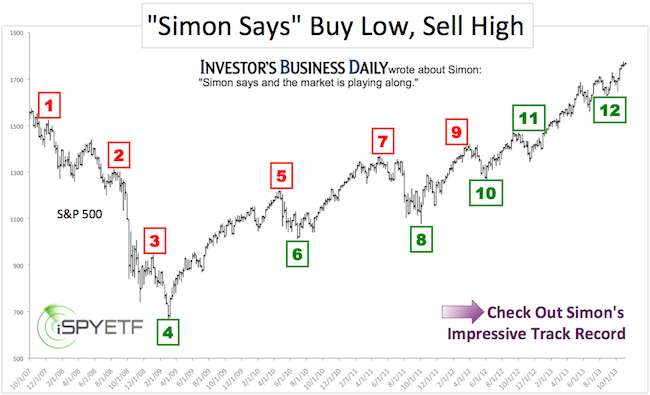 Yet, bullish signals from a well-known investor survey have been ignored for too long. Angry messages on comment boards also confirm a bullish message that shouldn’t be ignored. Allow me to point out a bullish indicator that’s being flat out ignored by the media and investors: Investor sentiment. The chart below plots the percentage of bullish investors surveyed by the American Association for Individual Investors (AAII) against the S&P 500. The percentage of bullish investors dropped to 29.60, one of the lowest readings of the year. This isn’t a historical extreme, but it’s noteworthy considering that the S&P 500 is yet at another all-time high. The dashed lines show what happened the last several times investors felt as gloomy as this week. Eight out of nine times the S&P 500 rallied. 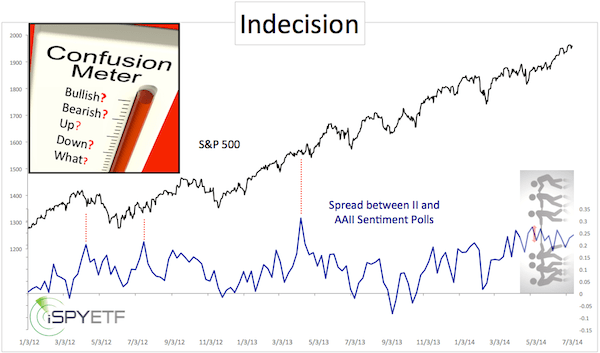 What makes the AAII crowd pessimism unique is how it contradicts other, more bullish sentiment polls. The bottom graph on the chart shows the difference between AAII bulls and bullish advisors surveyed by Investors Intelligence (II). 56.5% of advisors are currently bullish. The spread between AAII and II bulls is one of the largest and most persistent in the history of the two surveys. In yesterday’s article “The Long-Awaited S&P 500 Correction Already Happened” I dared to suggest that the expected S&P 500 correction already happened. Every investor should always look at all the facts. Fact is, bearish sentiment is too pronounced to ignore. A correction, which is overdue and would be healthy, may come any day, but data points like this caution that it may not happen yet. Bottom line, as long as support holds, the trend is up. The July 8 Profit Radar Report identified key support, which has been tested five times since (and held everytime). A lot can happen when you’re not looking, but a lot can happen even when you are looking. While everyone’s been waiting for the illusive correction, the S&P 500 ‘Richter scale’ actually shows the correction has come and gone. If you define correction as a 10% drop, the S&P 500 hasn’t had one in well over 1,000 days. This is the longest correction-free streak since the 1,127-day run from July 1984 to August 1987. But, corrections are not like annual holidays, they are more like earthquakes. Corrections don’t appear on schedule and they are not always felt the same way. Although the Richter scale may register a magnitude 3.5 earthquake, it may not be felt by all residents. The same is true with market corrections. Not all corrections are created equal, and the ‘S&P 500 Richter scale’ may have registered a correction that wasn’t felt by every investor. In fact, the chart below shows a perfectly legitimate correction period. How so? “I’d like to take a moment to talk about the potential for an extended rally. For many months analysts have emphasized (and continue to emphasize) the need for a 10% correction. There are two ways stocks can correct: 1) Price 2) Time. A price correction is straight-forward and easy to spot as stocks simply shed value. Time corrections are often overlooked by the investing masses as prolonged sideways trading covertly digests oversold readings and excessive sentiment. What we’ve seen since February delivers both. The S&P 500 and Dow Jones have treaded water while the Nasdaq-100 and Russell 2000 already lost as much as 8.67% and 8.71%, the biggest correction in well over a year. As pointed out in a number of prior Profit Radar Reports, investor sentiment has dropped quite a bit. The percentage of AAII bears is down to 28.34% and various media outlets have boldly gone on record predicting a crash or severe correction. Below is the chart referenced in the May 14 Profit Radar Report. It shows that the S&P 500 corrected internally. 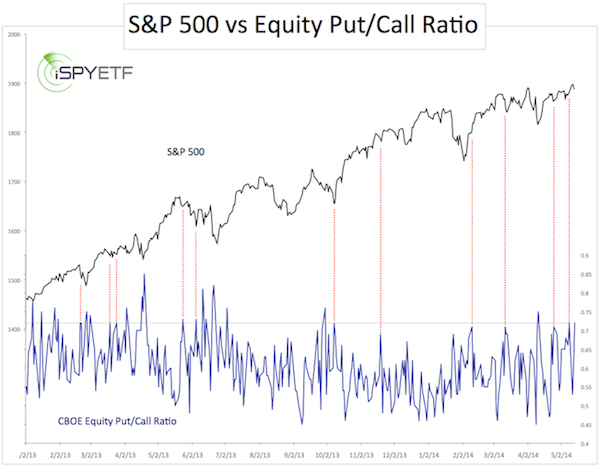 3 ½ months of sideways trading created enough of an oversold condition (based on option trader sentiment) to serve as a foundation for the next rally. In addition, the Russell 2000 lost as much as 10.75% from March 4 to May 15. In short, there was a correction. For the S&P 500 it was a correction by virtue of time, not price. From April to July the S&P 500 tagged on 160 points. Now we ask if the market is due for another correction or if it will keep grinding higher? The S&P 500 is not only stuck in a trading range. It’s also stuck in a conundrum of historical proportions. Analysis paralysis suffered by a variety of investors has rarely widespread. Why and what does it mean? The S&P 500 is incapacitated by a sentiment tug of war. Every trading day awakens to doomsday prophets, spreading their bearish gospel. Ironically, doomsday prophets are right. Many trustworthy indicators have indeed pointed to a sizeable correction … and yet they’ve been so wrong. When Will This ‘Broken Clock’ Be Right? 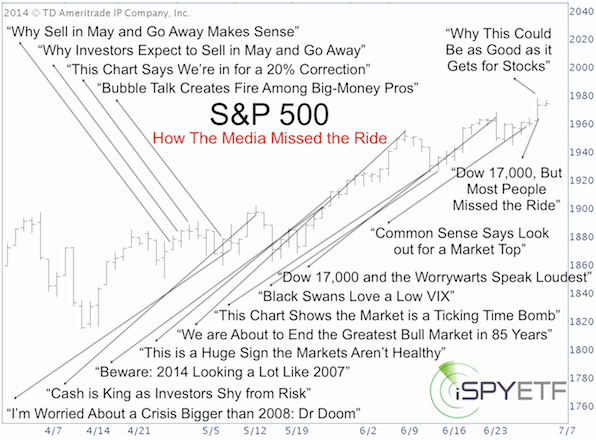 Even a broken clock is right twice a day, but the S&P 500 headline chart below shows that the media at large has been wrong, very wrong, for very long. One of the reasons many have been expecting a market crash is because of the VIX, which was recently at an 88-month low. The ‘original VIX’ even dropped to an all-time low. The chart below plots VXO against the S&P 500 (NYSEArca: SPY). 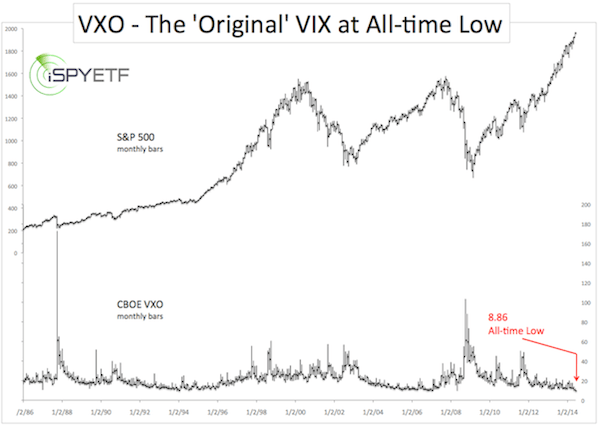 The original VIX – VXO – is now known as the CBOE S&P 100 Volatility Index. In 2003, the original VIX was renamed VXO and replaced by the VIX as we know it today. VXO is essentially the VIX for the biggest large cap stocks. By now every novice investor and their grandma ‘knows’ that a low VIX leads to major market tops. But that reasoning couldn’t be more flawed. On June 16, the Profit Radar Report ousted this false line of reasoning with three powerful charts in a controversial report: “The VIX is too LOW for a major market top”. Regardless of the VIX implications for the S&P 500, it reflects a level of complacency that contradicts the financial press’ pessimism. Investor sentiment is a powerful contrarian indicator, but current sentiment gauges are all over the map. The image below quantifies the level of analysis paralysis among investors better than any other chart. It plots the S&P 500 against the spread between two different sentiment polls. The Investors Intelligence (II) survey of investment advisors and the American Association for Individual Investors (AAII) survey of retail investors. 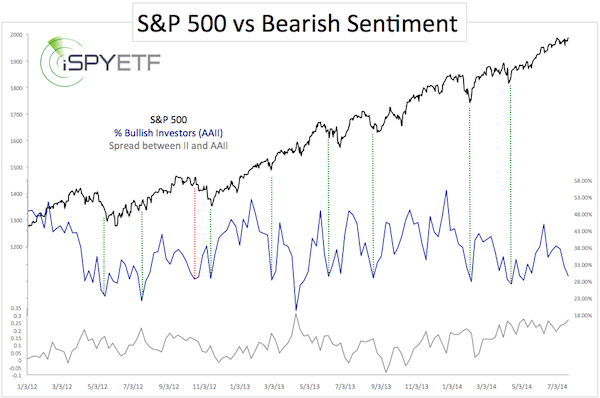 Advisors are predominantly bullish, investors neutral to bearish. The divergence between both opinions has rarely been more visible and is more persistent than at any other time in recent history. Who should we trust? The media? Investment advisors? Retail investors? No doubt, hindsight will bring the answer. Based on the current fragmentation, both bulls and bears will likely have a tough time to stage a sustainable move. It will probably take a ‘tiebreaker’ to unlodge the trading range. A break of support should give bears the upper hand in this struggle (otherwise expect a grind higher). The Profit Radar Report used an unconventional indicator to identify key support more than two weeks ago. Since then it’s been tested (and proven correct) five times. Here’s a free look at key support and the analysis usually reserved for subscribers of the Profit Radar Report. On Thursday, the S&P 500 saw the first loss of more than 1% since April 10, 2014. This sell-off stoked the talks about a major correction, but bottom line is that the S&P 500 remains around important short-term support. 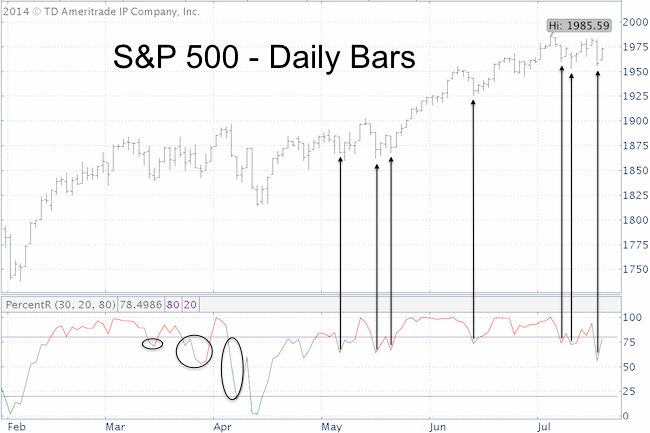 On July 8 we used a little known indicator to spot key support for the S&P 500. This little known indicator (which got some flak on the Yahoo comment board, but proved yet again correct) is a good tool when it comes to identifying the end of a momentum rally. The indicator is called percentR (don’t shoot the messanger, I didn’t name it). Never heard of it? That’s because you won’t read about this indicator on CNBC, MarketWatch or Bloomberg. That’s is a good thing. Just recall how many charts and indicators the media has used in recent months to warn of a major crash (too much media coverage spoils any good indicator). An initial percentR dip below 80 is called a ‘bullish low-risk entry’. The arrows mark all bullish low-risk entries since May. All seven of them were followed by bounces. The black circles illustrat failed low-risk entries. What is a failed low-risk entry? 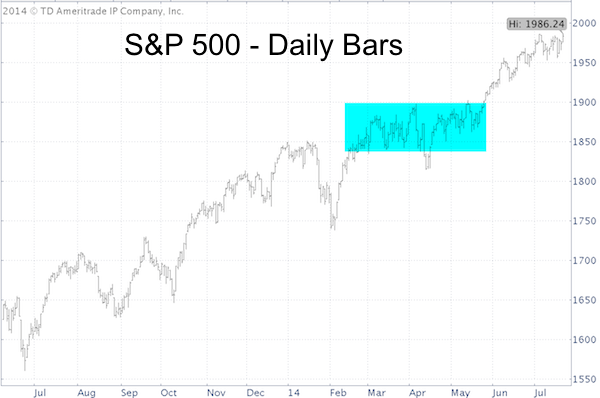 When the S&P 500 (NYSEArca: SPY) closes below the level (daily low) that triggered the low-risk entry (dashed red box). Here is where it gets interesting: percentR has triggered three low-risk entries since July 8 with daily lows ranging from 1,953 – 1,959. This shows a) that the rally is getting choppy and b) that the 1950 – 1960 level seems significant. A close below 1,953 would be a failed low-risk entry and an indication that the rally may be over. In the spirit of disclosure, I want to mention that there is one scenario that sees a brief dip below 1,950 followed by a rally to new highs. It would be wicked and fool most of Wall Street (which is exactly how the market likes it). VIX seasonality is fascinating right now, because the VIX seasonality chart projected a major low on July 9. So Thursday’s 32% one-day VIX spike is no real surprise. 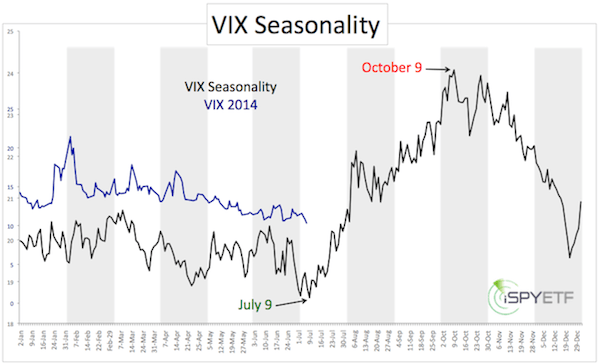 Here’s a detailed look at the VIX seasonality chart and it’s possible implications for the S&P 500. The consumer discretionary sector has been one of the driving factors behind the massive S&P 500 rally from the 2009 low. 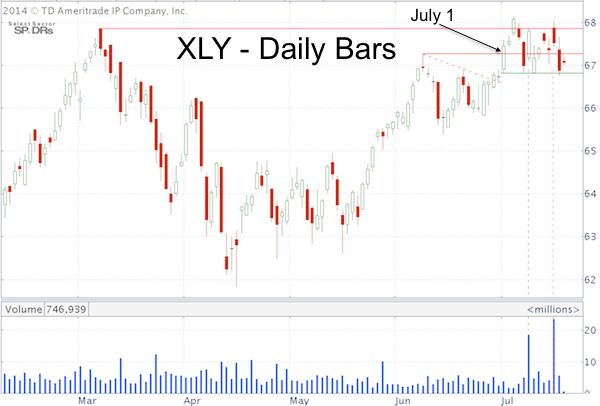 In the beginning of June, XLY sported a unique technical pattern that may provide clues for the S&P 500. Contrary to popular belief, the U.S. consumer has done their fair share to lift stocks. From its 2009 low to its July all-time high, the S&P 500 (NYSEArca: SPY) has gained 197.78%. From its 2009 low to its July all-time high, the Consumer Discretionary Select Sector SPDR ETF (NYSEArca: XLY) has gained 329.84%. Because of its economically sensitive nature, the consumer discretionary sector can provide early clues for the S&P 500. “XLY already broke above the dashed trend line and the short solid red line marking the handle high. This is the beginning stage of a break out. However, trade has yet to overcome the March high, which was a red candle high and should be meaningful resistance. It is also said that cup and handle breakouts after a long-term rally are less powerful than ones at the beginning. Although the beginning stages looked promising, XLY wasn’t able to overcome ‘cup rim’ resistance at 67.85 and the cup-and handle has basically been a non-event (like pretty much everything else lately on Wall Street). The pattern for other consumer discretionary ETFs like the Vanguard Consumer Discretionary ETF (NYSEArca: VCR) looks similar. Another little nugget the XLY chart offers is that there is short-term support around 66.80. Similar to XLY, the S&P 500 is also trading right above meaningful short-term support. The VIX has been trending lower for weeks on end. Many investors got burned trying to be ahead of an elusive VIX rally … until yesterday. The 32% one-day spike came right on queue, according to the VIX seasonality low. You might as well call me a broken record. For the last few months, I’ve continually advised to postpone VIX buying until after July 9. Why July 9? The VIX seasonality chart plots this year’s VIX performance against the ‘average’ VIX performance based on daily closing prices from 1990 to 2013. VIX ETPs like the iPath S&P 500 VIX ETN (NYSEArca: VXX) and ProShares Ultra VIX Short-term ETF (NYSEArca: UVXY) lost between 28 – 78% in 2014. However, the VIX spiked 32% on Thursday. This is a massive overreaction, considering that the S&P 500 (NYSEArca: SPY) declined only 1.18%. We’ve seen similar VIX kneejerk reactions in the past, and they were soon followed by a lower VIX and higher S&P. Will this time be different? Will the VIX continue to rally and the S&P finally embark on the much advertised correction? Only if the S&P 500 drops below key support. Thus far the S&P bounced three times from this support, and VIX downside is limited as long as it holds. S&P 500 Suffers First 1%+ Drop Since April 10 – Is this Bad News? Today the S&P 500 lost more than 1% for the first time since April 10, 2014. This sell off comes amidst many predictions for a bull market end or market crash. In reality, how significant is today’s loss? Streaks exist to be broken. The S&P 500 just broke a 66-day streak of not losing more than 1%. April 10 (blue box) was the last time the S&P 500 lost more than 1%. Is today’s loss a bad omen? The S&P 500 is still within 1.5% of its all-time highs, so calls for a bull market end or crash are no doubt premature (we all know the odds of catching a falling knife). Could today’s sell off lead to a deeper correction? Today’s loss happened on elevated trading volume. 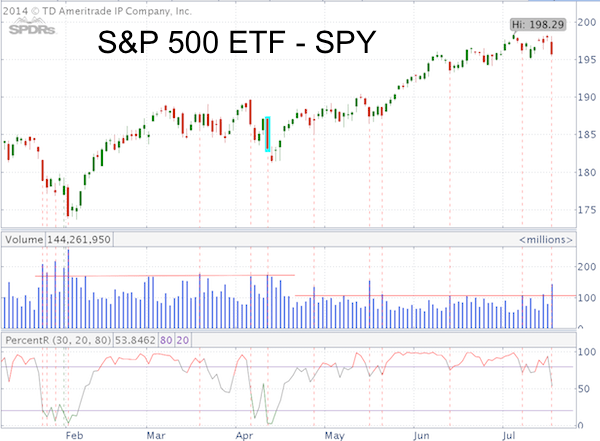 The S&P 500 ETF (NYSEArca: SPY) chart shows other recent high volume declines (dashed red lines). Some of them were followed by additional selling, but most of them were not. The July 8 Profit Radar Report pointed out that 1,955 is important short-term support (on a closing basis) for the S&P 500. This support has yet to be broken. The July 13 Profit Radar Report highlighted key resistance at 1,980 – 1,985. So far the S&P wasn’t able to break above resistance. In other words, despite today’s sell off, the S&P 500 remains range bound between support and resistance. So could today’s decline be the beginning of a larger correction? Yes, but it could just as well be a minor buying opportunity. Trusted indicators certainly have a better track record distinguishing one from another than attention-grabbing headlines. In fact, one of those trusted indicators has predicted 6 of the last 8 buying opportunities correctly. If this indicator fails (and it’s at a ‘do or die’ point right now), it will foreshadow lower prices.